More friends and a blog: Sew easy! 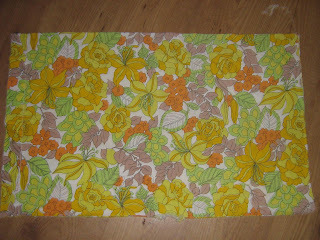 When I was tidying the garage last week I came across this old pillow case (in our rag bag) and loved the colours. I thought it might be just the thing to try out sewing a pillow case skirt. Here it is, takes about ten minutes to make. This is my first try, I am thinking that next time I will add some big front pockets for holding assorted gardening odds and ends and I will also use the pillow seam as the back of the skirt so that it can have a slit for more leg room. This is my kind of sewing, all I had to do was to sew a casing for the elastic waist. That's it. 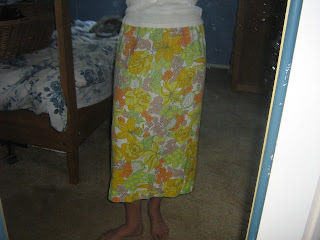 The hem of the pillow case became the hem of the skirt. (you getting a good laugh here, K?) Now I will be on the lookout for pillow cases whenever I go thrifting. Hey Katherine and Samantha, did you know we are getting our own Sally Ann on this side of the bridge? O.K - I went ahead and put the slit in the back by just unpicking the seam a bit and finishing it, it is much more comfy for gardening this way. You guys and your tag-team posting are too cute. And I'm loving this skirt. I saw the pillowcase and thought that you were making the pillowcase bag that's been making its way around the blog world, so I was pleasantly surprised to scroll down and see your cheery skirt! I think the pillowcase bag idea comes from the recent one shown in Martha Stewart's mag. It's quite clever and looks real easy to sew. Going to have to keep an eye on you guys, you might cut anything up and turn it into a quilt or something! I'm impressed - 5 posts in one day. wow. i LOVE it. i've made pillowcase dresses for my A, but pretty sure i couldn't FIT my own self into a pillowcase. AHEM!